If Microsoft orchestrates next month's Microsoft Windows 10 upgrade as it did 2016's mid-year Anniversary Update refresh, it will take about three months for the latest version to reach most eligible devices. According to advertising network AdDuplex, 60 days after the Aug. 2, 2016, introduction of Windows 10 1607 -- aka Anniversary Update -- just 35% of measured Windows 10 PCs were running the upgrade. By the 90-day mark, however, that number had soared to 80%, showing that Microsoft, after a purposefully slow start, had stomped on the update accelerator. 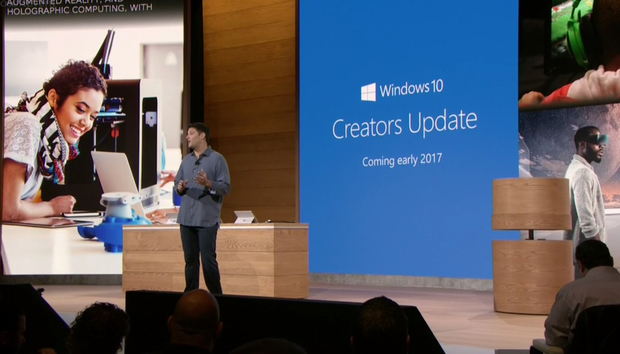 There has been no sign from Microsoft that Creators Update, the company's label for April's feature upgrade, will be deployed any differently. Microsoft has made clear over the first two Windows 10 upgrades -- the first, pegged 1511 to mark its November 2015 release, the second, marked 1607, both in the year/month format -- that it has been in no rush to get them out to customers. AdDuplex's data, which the Lithuanian firm issued last week, backed up Microsoft's assertions of a measured pace. Although there are multiple reasons for Microsoft gradually opening the update spigot, including insuring that the content delivery network isn't overloaded, the most important to the Redmond, Wash. company has been the desire to break as few PCs as possible. In past cases, Microsoft has used its extensive -- some have called it invasive -- Windows 10 telemetry to identify the machines most likely to install the upgrade without problem, then started with those PCs. As the upgrade rolls out, Microsoft examines incoming data and, if necessary, modifies the installation process before expanding the pool of eligible devices. That telemetry lets Microsoft spot potentially-problematic PCs and sequester them until it understands why such machines balk at the upgrade. The piecemeal upgrade process is not unique to Microsoft. Mozilla, for example, has used it for years to deploy new versions of Firefox. It's impossible to know whether Microsoft's approach works as intended. Users encountered a long list of problems installing last year's Anniversary Update for at least the first month, for instance. But if AdDuplex's data is accurate, it signals that Microsoft eventually got the upgrade on a majority of PCs. AdDuplex established Windows 10's upgrade tempo by mining data from third-party Windows Store apps -- also called UWP, for "Universal Windows Platform," apps -- that are installed on PCs. The data was collected March 21, AdDuplex said. But because UWP apps that include AdDuplex's SDK are unlikely to be on every Windows 10 PC, its numbers are unlikely to encompass the entire Windows 10 ecosystem, especially the part maintained by enterprises.